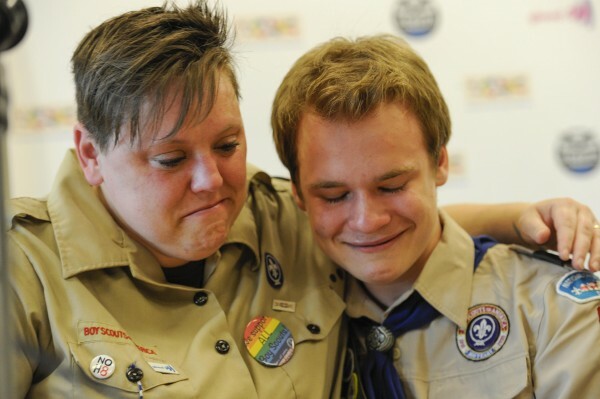 Jennifer Tyrrell (L), who was removed from her position as a den leader in 2012 for being gay, hugs Pascal Tessier, 16, after a resolution passed to allow openly gay scouts in the Boy Scouts of America at the Boy Scouts' National Annual Meeting in Grapevine, Texas in this May 23, 2013, file photo. One of the nation’s first openly gay Eagle Scouts has a message for Amazon: Stop supporting an organization that discriminates. Pascal Tessier, a 17-year-old from Chevy Chase, Md., who made history when he received the Boy Scouts’ highest ranking this year, held a news conference Monday in front of Amazon.com’s office in Northwest Washington. At the event, he announced his intent to deliver more than 120,000 signatures to the company’s Seattle office in an effort to encourage the online retailer to drop the Boy Scouts from the list of organizations that can benefit from its charitable program, AmazonSmile. Tessier’s effort comes after the Boy Scouts kicked out Geoff McGrath, an openly gay scoutmaster in Seattle. Tessier, a senior at Bethesda-Chevy Chase High School in Bethesda, Md., put his Eagle Scout rank on the line last year when he spoke to the media about being gay and participated in a public demonstration in advance of a vote held by the National Council of the Boy Scouts of America to determine whether to lift a long-standing ban on gay members and leaders. Ultimately, the council voted to accept gay youths but not gay adults. Tessier said what happened to McGrath confirmed for him that his time with the organization is limited — unless change occurs. A spokesman for Amazon said in response to the protest that customers can select from nearly a million legally recognized charitable organizations on AmazonSmile. “We rely on lists published by the Southern Poverty Law Center and the U.S. Office of Foreign Assets Control to determine if certain organizations are ineligible to participate,” Ty Rogers said. “We’re just asking Amazon to stand by its own policy, and its commitment to the LGBT community,” Tessier said. On Wednesday, Tessier plans to travel to Seattle to formally petition Amazon.com and its founder and chief executive Jeffrey P. Bezos, who also owns The Washington Post. Tessier said after he graduates from high school he plans to attend college in Ohio. He hopes to continue participating in Boy Scouts — but he’s aware of the reality.